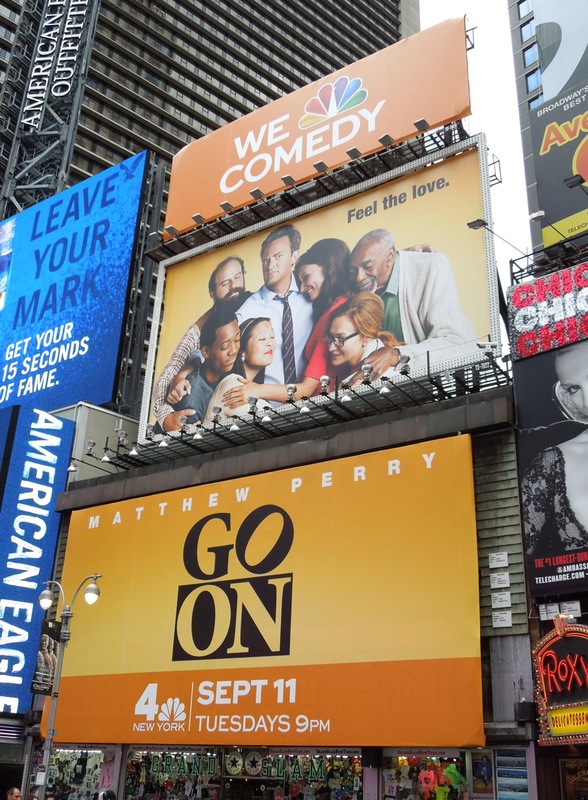 With fellow former Friends stars like Jennifer Aniston forever in the news for who she's dating and Matt LeBlanc winning a Golden Globe for his role in Showtime's Episodes, Matthew Perry must feel the pressure for his new NBC comedy show Go On to succeed. 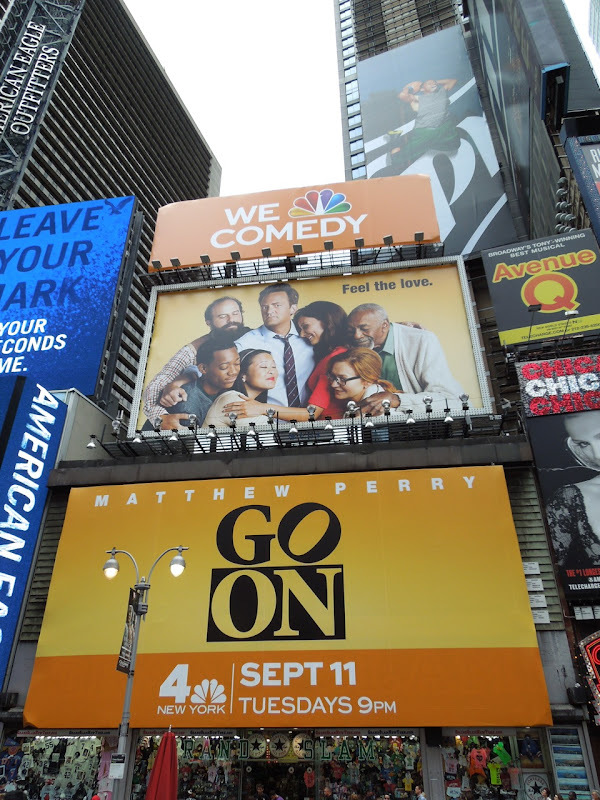 Hopefully it will be funnier than his failed ABC sitcom from 2011 about an operations manager of a second-rate sports arena, Mr. Sunshine. 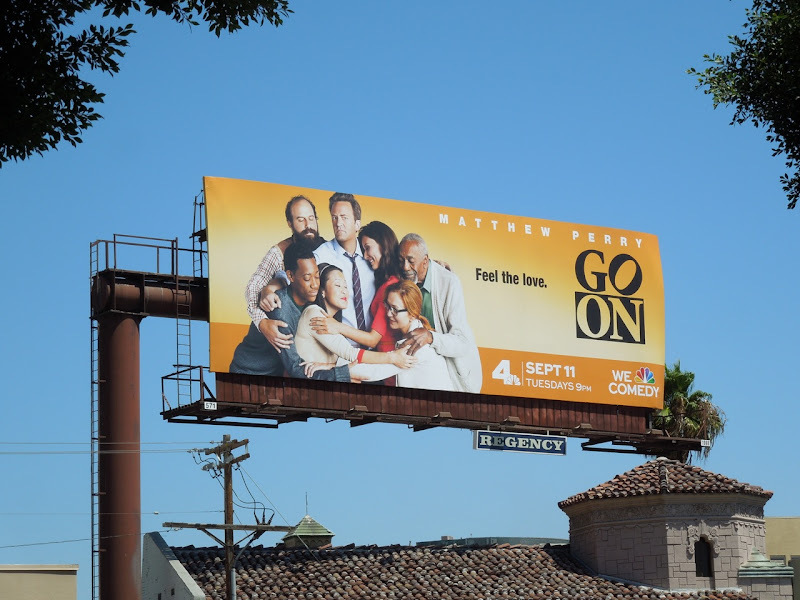 This time he has his own personal support group to help him, as he plays a recently widowed sportscaster, 'Ryan King', forced to go to group grief counseling before he can return to work. 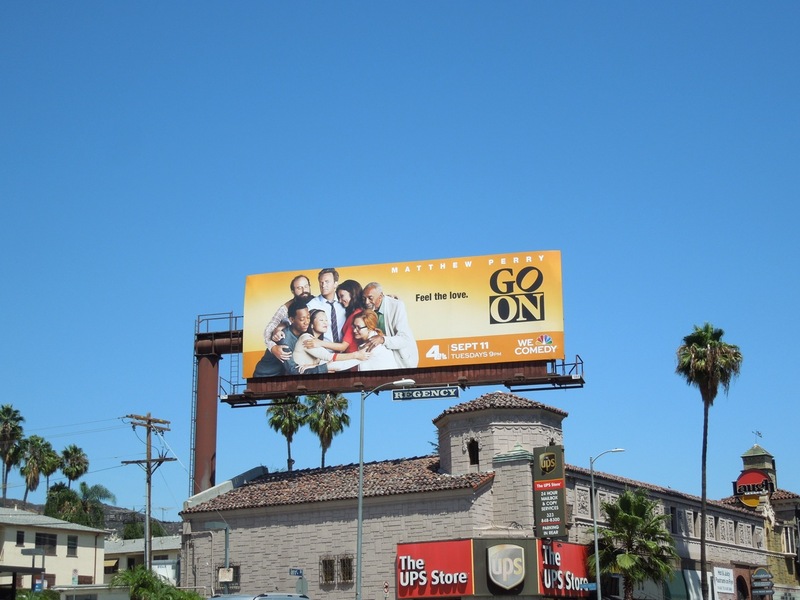 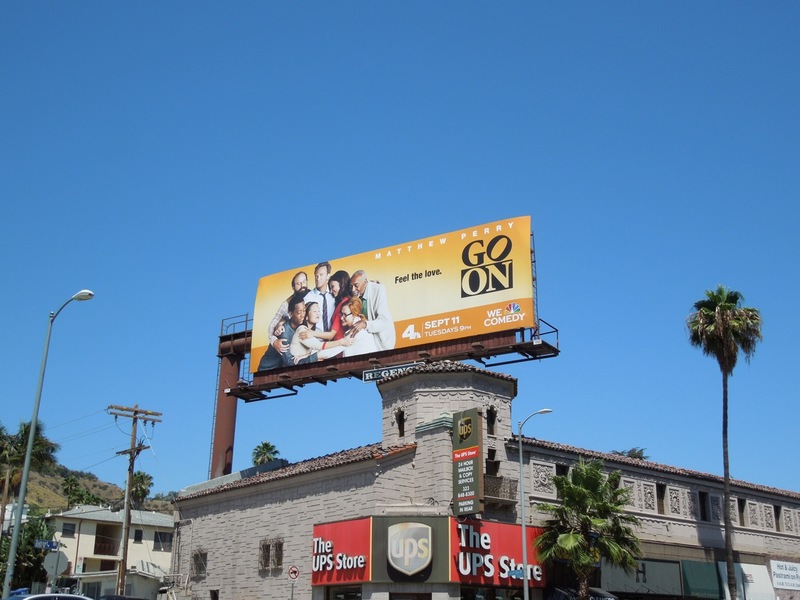 This vibrant series premiere billboard for Go On is certainly an improvement over the dull Mr. Sunshine billboard, and this new NBC ad was snapped along Sunset Boulevard at Laurel Canyon Boulevard on August 14, 2012. 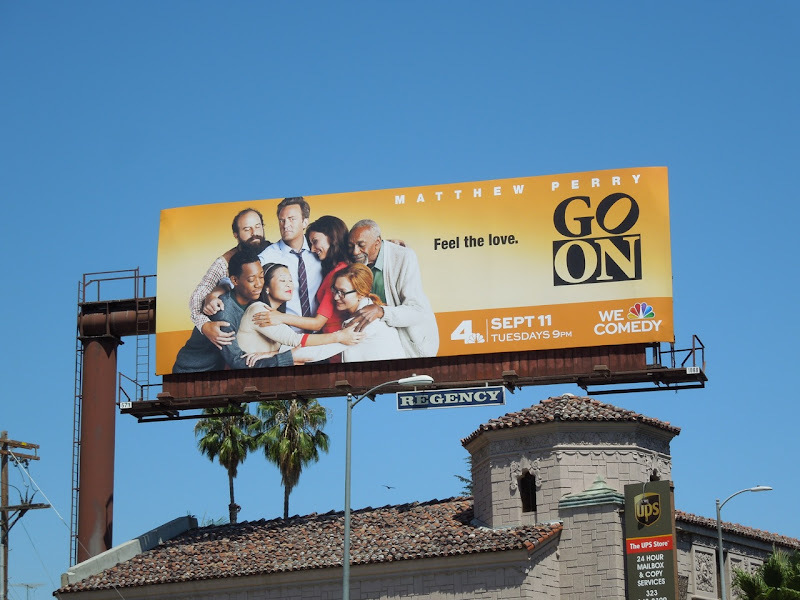 UPDATED: If you thought there were a lot of ads around Los Angeles for Go On, just wait until you see all the support that NBC is throwing at their new sitcom in New York City. 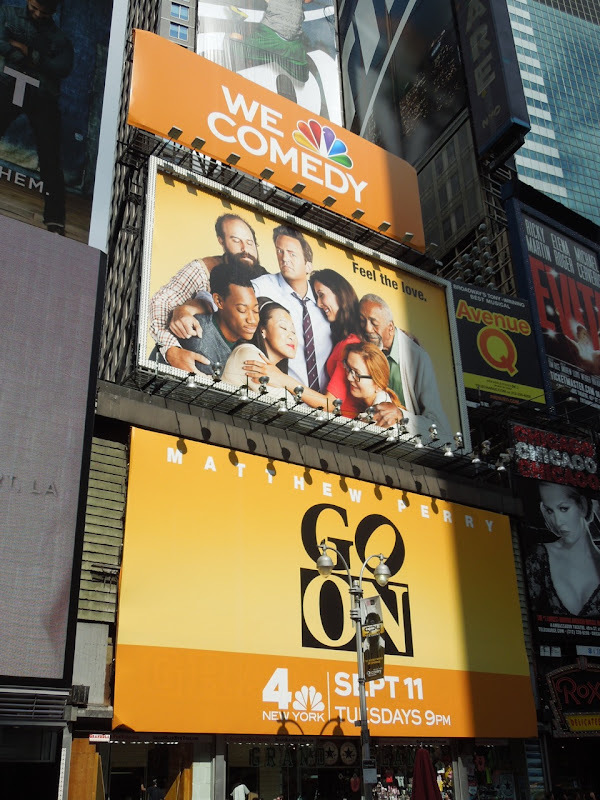 First up is this giant group hug in Manhattan's infamous tourist destination Times Square. 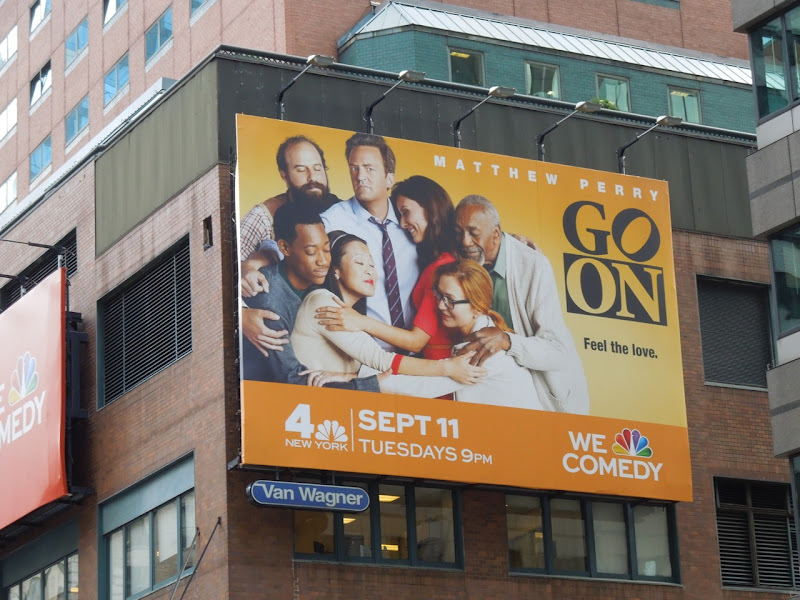 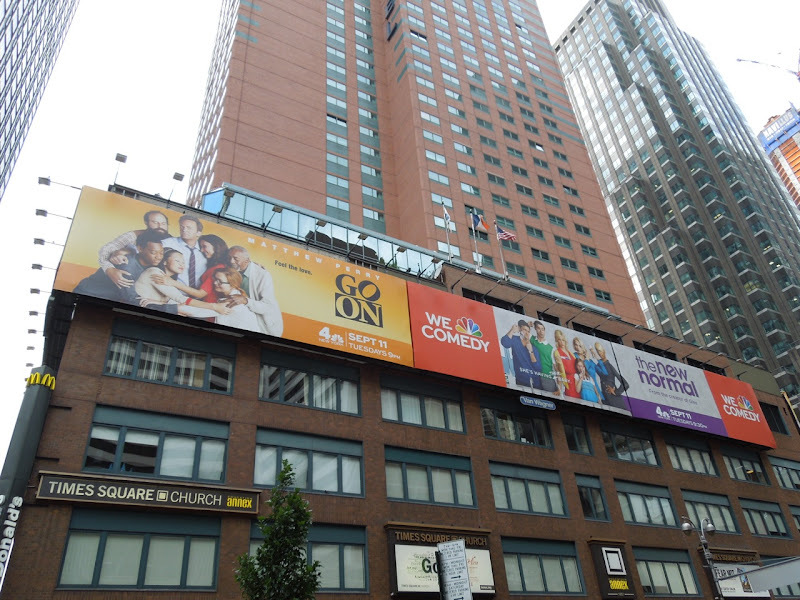 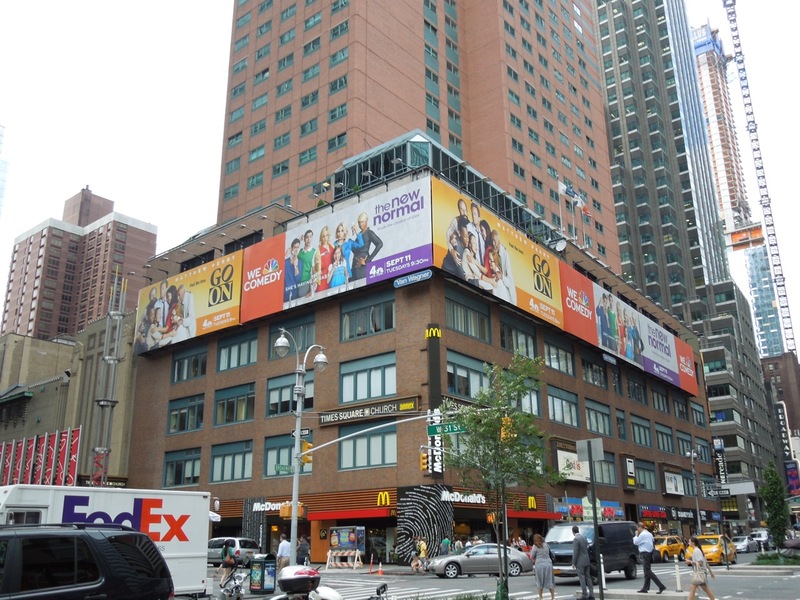 Also in close proximity to Times Square, along Broadway at West 51st Street, is this collection of ads for Go On and another of NBC's new comedy shows, The New Normal. 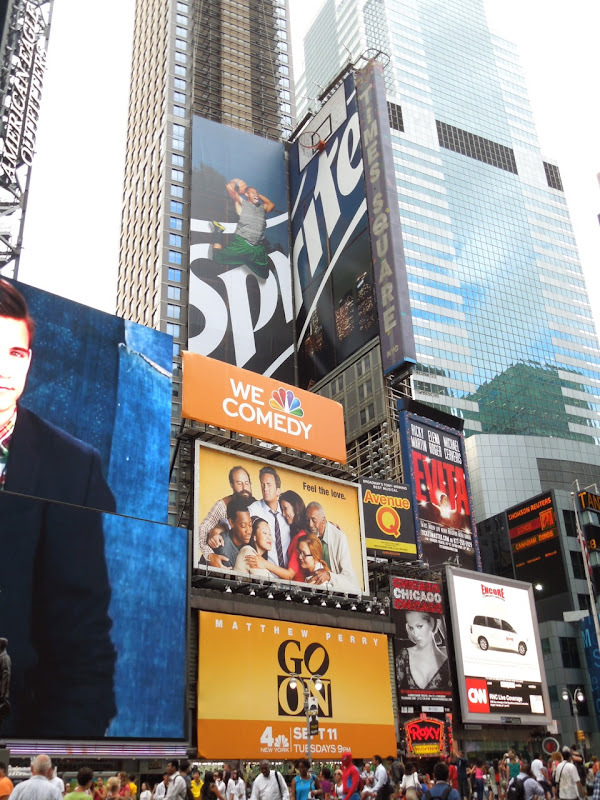 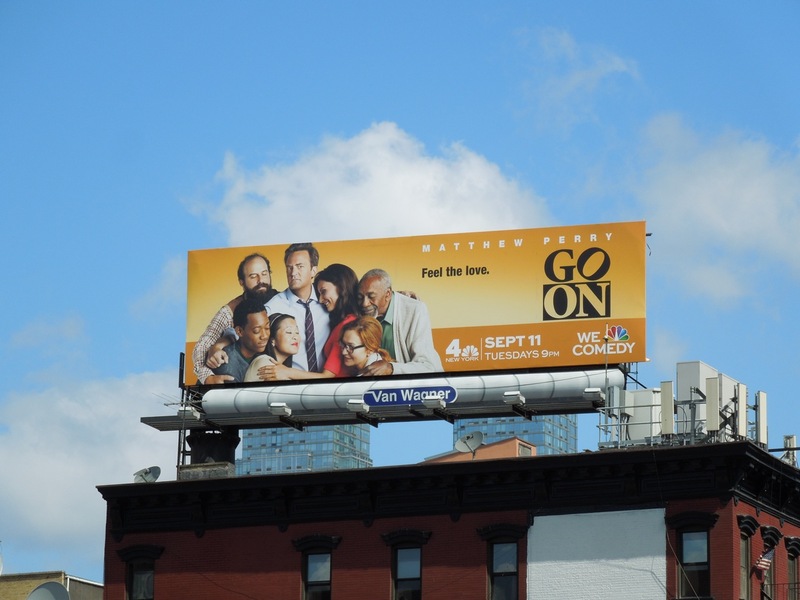 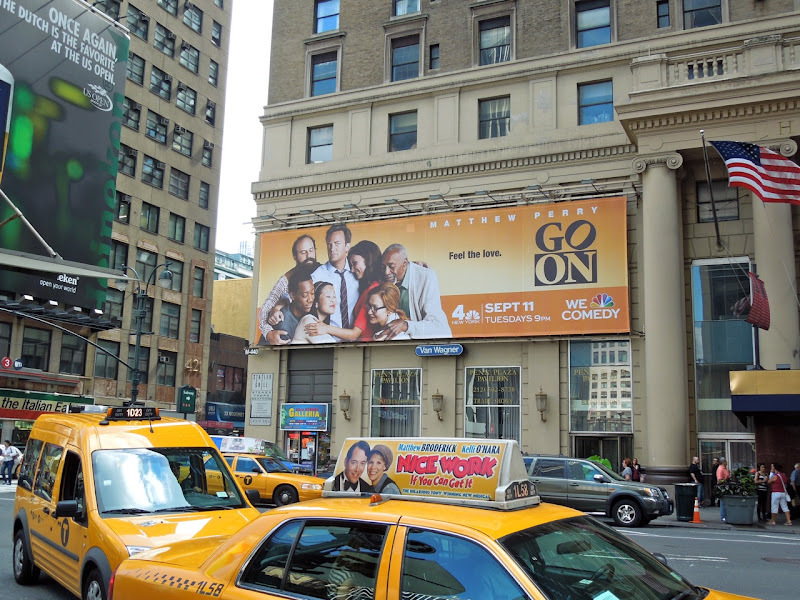 Finally this other Go On ad was spotted along 7th Avenue near major commuter hub Penn Station and another landscape billboard above 10th Avenue at West 33rd Street on August 28, 2012. 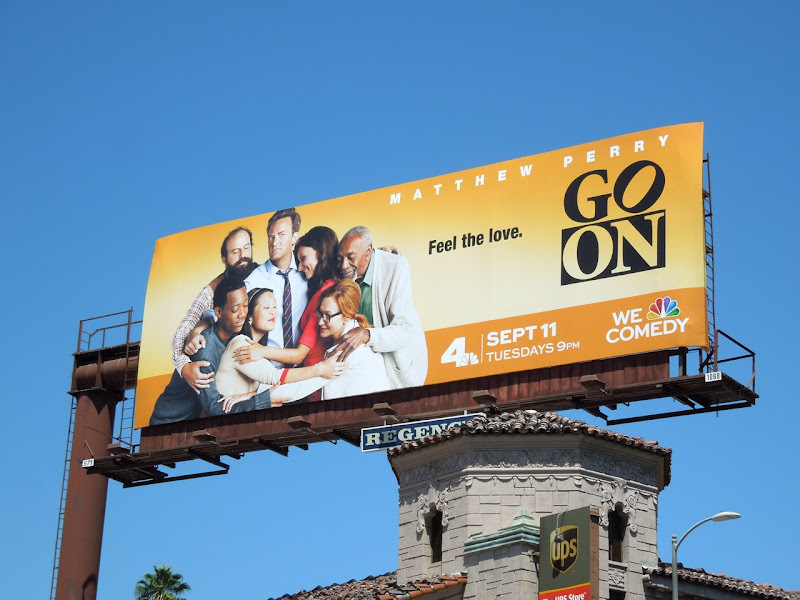 One thing is clear, if Matthew Perry's new sitcom fails, it won't be for lack of marketing support.